Please do not run away. We are about to use adult language here. For example we will be using the word trigonometry. Still here? Good. Here is a very pedestrian looking lunar eclipse photo taken with a 280mm lens*, cropped. Very Ordinary Photo of the Lunar Eclipse with the planet Uranus in the lower left. This past lunar eclipse several of us put our heads together to try to come up with a more creative photo than the one above. We had a trigonometry problem, however. On the West Coast the last moment of totality occurred at 4:24 AM PDT. We were brave enough to be out at any time of night – even if it meant extreme sleepiness in our day jobs but our problem was that the lowest the moon would be in the sky at the last bit of totality was 32.6 degrees above the horizon. We determined that angle using Stellarium, by the way. Unfortunately there is pretty much nowhere to go to get a nice large moon near an interesting object when the moon is almost 33 degrees high. Wait: Why do we want the moon and the object to be similarly sized? Here is why… we want the moon to be noticeable like the Fantasy version below, not merely “present” like the real photo on the right. Even bigger would be better, right!? Notice above right (Reality) and below how tiny the moon is compared to the building in the foreground? Indeed, if you see a photo taken from anywhere on the West Coast where the eclipsed moon is significantly lower in the sky or larger than shown against foreground, you know it has been “photoshopped“. You can go one step farther and calculate the distance from the object with ‘distance = 85.9 * COS(32 deg)’. Of course after all that calculating you will still need to find a location, have contingency plans for weather and so on. At StarCircleAcademy we have built some tools and put together materials to help in all these endeavors. We teach these things in our NP111 Catching the Moon Webinar. Below is where we ended up. This image is from our friend and co-conspirator Andy Morris. Four of us plotted and schemed to get an interesting shot. Above is Andy Morris’ result. Click the image and you can read a great article about how he created the shot using Photoshop Skills at his site: PhotoshopScaresMe.com. In fact, it’s a great article which we strongly encourage you to read. You’ll learn how he composited the images together in Photoshop as layers. Andy has more details including how alcohol played a part in the process. Mostly I, Steven, was the wet blanket explaining why the geometry was all wrong. The main problem with the wind turbines is that the angle to the top of them is something around 12 degrees above the horizon which is 40 moon diameters below the eclipse. This might make an interesting foreground (see below)… Somebody want to check if they will mind us being on their property in the wee hours? *Ok, we lied, it was actually a 70-200mm lens with a 1.4 TC on a full frame camera, but the net is the same: 280 effective mm focal length. Where did you go and what did you get in your planning efforts? Post a comment and link below… we’d love to see what you came up with! 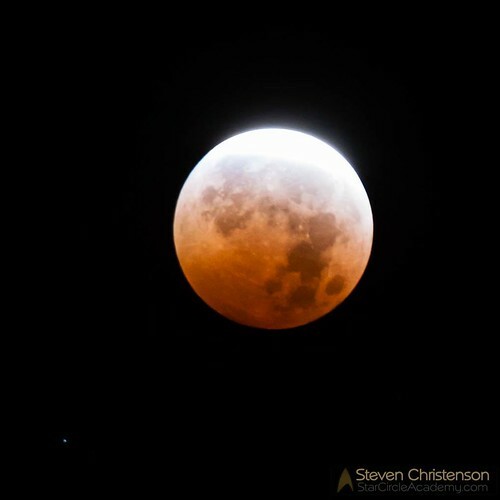 This entry was posted in Astronomical Event, Astrophotography, Composites, Creativity, Photo Processing, Photo Tip, Ravings, Trivia, Weather and tagged calculations, eclipse, Geometry, Location Selection, lunar, moon, planning, stellarium, trigonometry on October 23, 2014 by Steven Christenson. If you missed the last total lunar eclipse, don’t worry. You’ll have another chance in October, 2014. For that, I’m grateful since as you can see I had some problems with my apparatus (the CamRanger). The battery failed after the 7th shot of the moon you see below, and then it stopped working again after 3 more shots, and needed to be slayed and restarted just as the moon was transitioning to fully eclipsed. But this column is not about our troubles, it is about how I planned for the lunar eclipse shot you see below. Determine which DIRECTION I needed to face to capture the moon. Determine how “wide” a lens I needed to get the sequence I wanted. Monitor the weather at each location. After planning all that was left was to make a last-minute decision where the most likely target would have favorable conditions and make any final on-site adjustments. I had a Plan D, too… but it was also in San Jose so it would have only been chosen had I found some serious obstacle at the City Hall rotunda. Determining the angles needed is pretty simple. I used The Photographer’s Ephemeris including all the nifty tricks we teach in our Catching the Moon Webinar. Below you can see a screen shot from the Photographer’s Ephemeris which shows the moon altitude and direction at the beginning of the eclipse. I also moved the time ahead to show the same for the middle of the eclipse. The moon’s altitude angle (32 to 41 degrees) gave me an idea how close to be to the rotunda to get the moon overhead. Lower angles allow me to get farther away which allows me to photograph the moon larger relative to the foreground object. This eclipse, however, and the one in October will have the moon high overhead. There is no good substitute for knowing what interesting foregrounds are possible. And also knowing which direction(s) you should be facing. 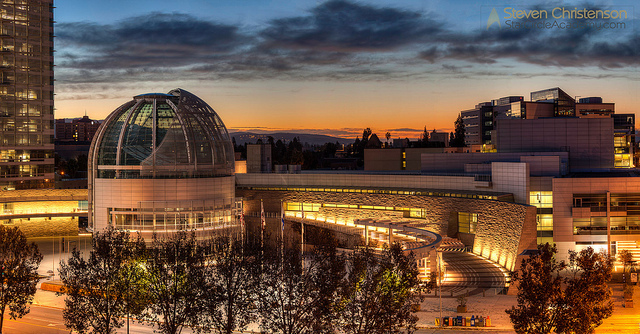 I knew that the San Jose City Hall Rotunda was generally easterly because I had watched a sun rise through it. I also knew that the eclipse would be at maximum when the moon was in the southern sky so I knew that the range was SE to S directionally. 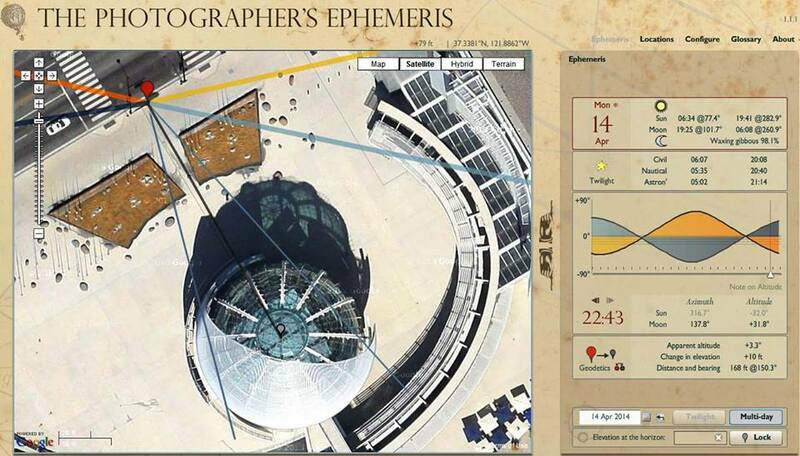 You can see a diagram from The Photographer’s Ephemeris below for more complete planning. I had to know approximately how tall the foreground object is. For the San Jose City Hall I flat-out guessed. I found the overall height of the building through Google, and I guess the Rotunda was 60 to 80 feet tall. My original calculations had me much closer to the building… it was only when I got on site that I realized that there were adaptations that needed to be made. Remember that the Rotunda was plan C. I kept a close eye on the weather for each of the planned sites. 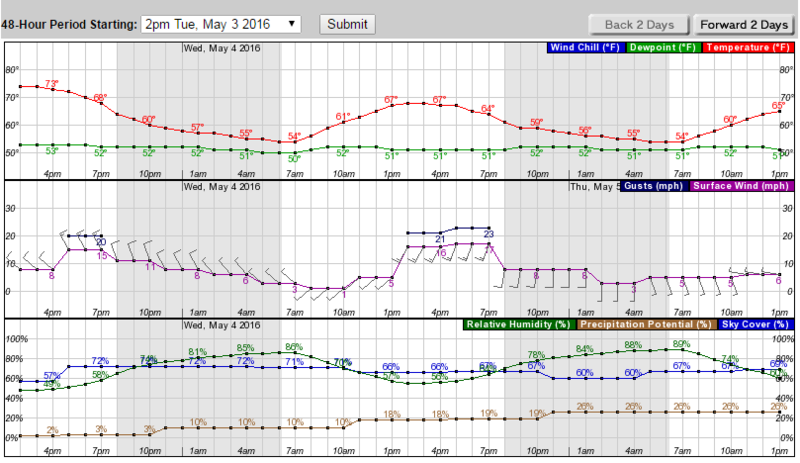 My favorite weather app is provided by weather.gov – in particular the hourly graphs. We talked about this tool in detail in a prior column. Why do I like it so much? 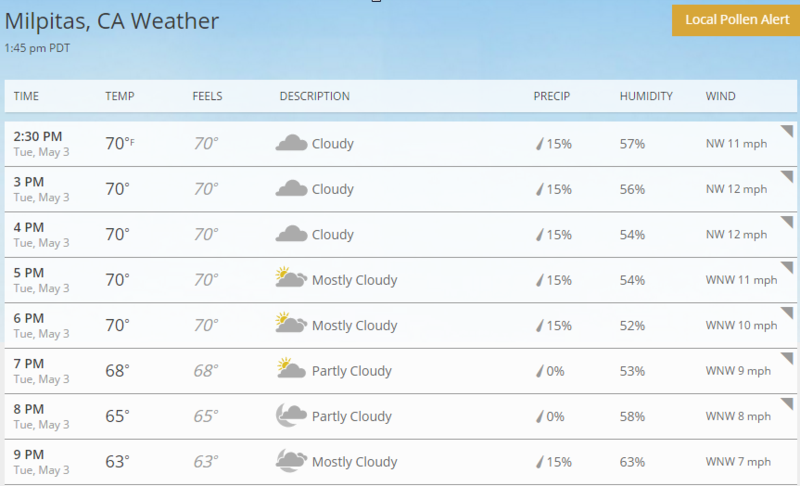 Because it gives me numbers instead of “partly cloudy”. It was pretty obvious that the coastal region for Plan A, and the San Francisco Landmark (plan B) were likely to have bad weather – both fog and clouds. Indeed my friends who headed those directions were frustrated by poor visibility. 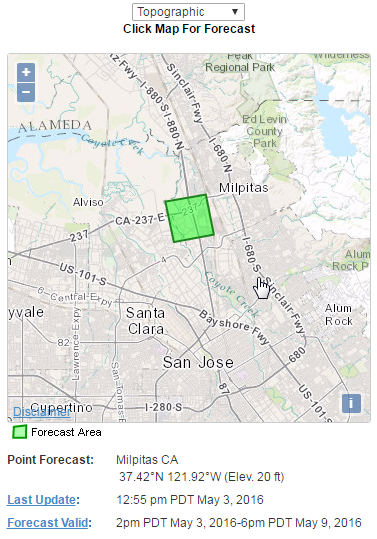 We had clouds passing through San Jose, but as the weather predictions had read: it got clearest right near totality, and overall was not a hindrance. When I first got to the site, I realized that the Rotunda was taller than I thought. I set up across the street in order to be able to have the moon over the Rotunda… but there were other problems, too. One of the problems is the floodlight on the top of the building. Another was a street light just to the right of where the red marker is in the graph below. These are problems that would only reveal themselves if you visit at night! And then there are all of those flag posts. My original guess at the Rotunda Height would have allowed me to stand between the fountain (brown area) and the building… but that clearly didn’t work as the rotunda was too high. Setting up across the street (and very low) also had its challenges… namely buses and cars that came regularly. I also realized that I had miscalculated the eclipse time by an hour (forgot it was now daylight savings time). 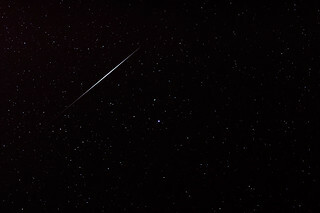 The miscalculation turned out to be a good thing as it left plenty of time to move around. It would seem the ideal spot was in the MIDDLE of Santa Clara Street, but that wouldn’t have worked, of course. Eventually I picked the spot with the red marker as a compromise between altitude of the moon above the structure, removing the glare from the tower lights, the wash-out of the street light, and the many flag poles in the way. 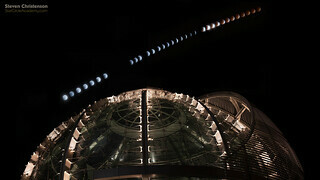 If only my CamRanger had cooperated, I’d have had a continuous sequence of shots of the moon passing over the Rotunda. There is always October… and maybe Plan A will work for that! Of course that’s not ALL that was required to get the shot. I also had to composite each of the moon shots into their proper locations. I did that by first taking a panorama of the area, then making sure that when the exposures began I had a piece of the rotunda in each shot so I could properly align the moon over its actual location. 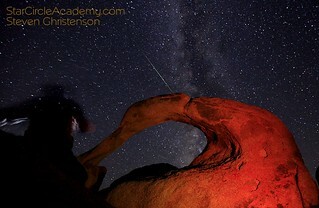 The creation of the image used the Easy HDR method we have previously described. 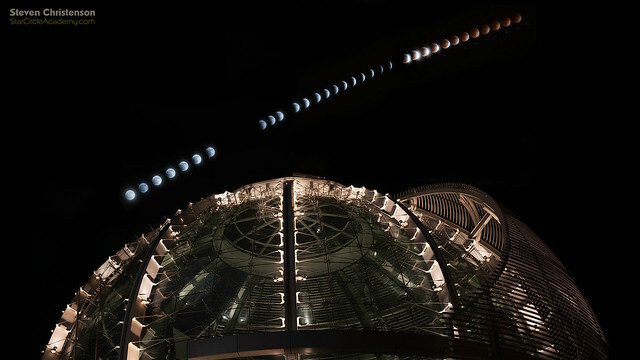 This entry was posted in Astronomical Event, Camera Control, Creativity, Maps, Weather and tagged calculations, eclipse, foreground, lunar eclipse, planning, rotunda, The Photographer's Ephemeris, time-lapse, TPE on May 5, 2014 by Steven Christenson.